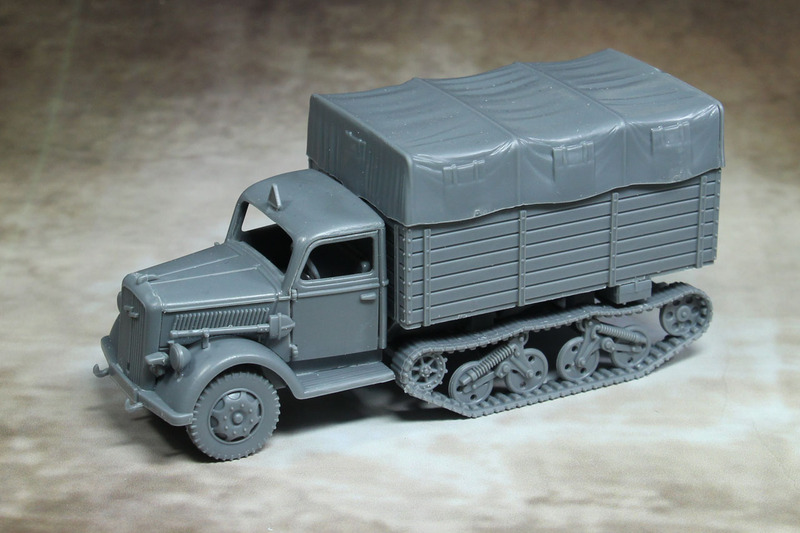 The Blitz saw action on all kind of theatres, where as the Maultier, that was introduced to be used in harsh conditions like the snow and mud of the Eastern Front, "only" saw the battle fields of the late years of war. 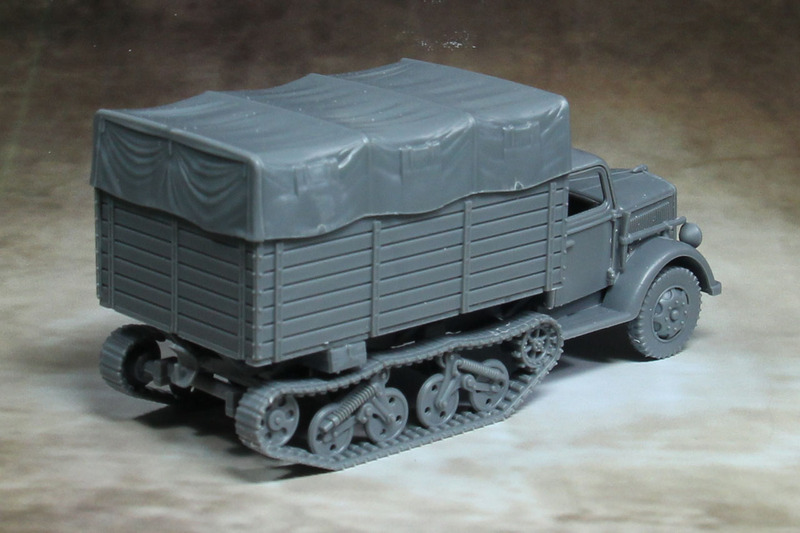 Warlord Games offers this kit for 18 GBP. 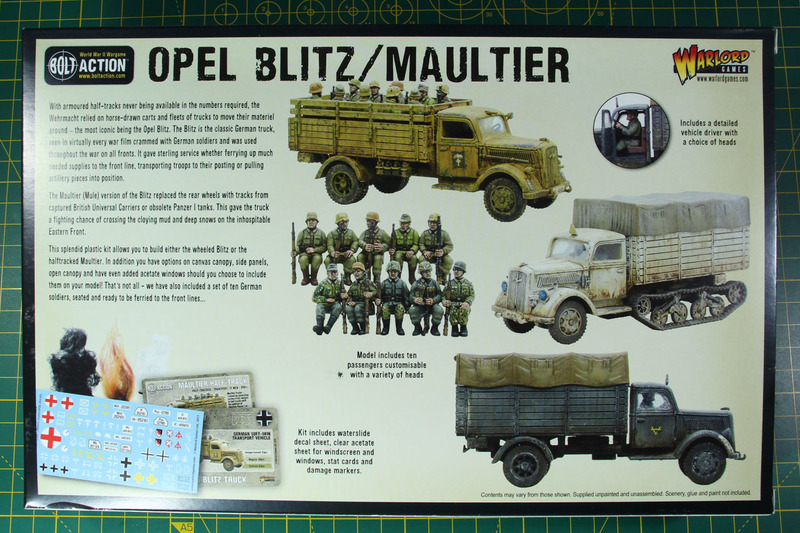 It covers one Opel Blitz / Maultier in 28mm, including seated infantry, decals, stat cards, tokens and a coloured multipage assembly instruction. 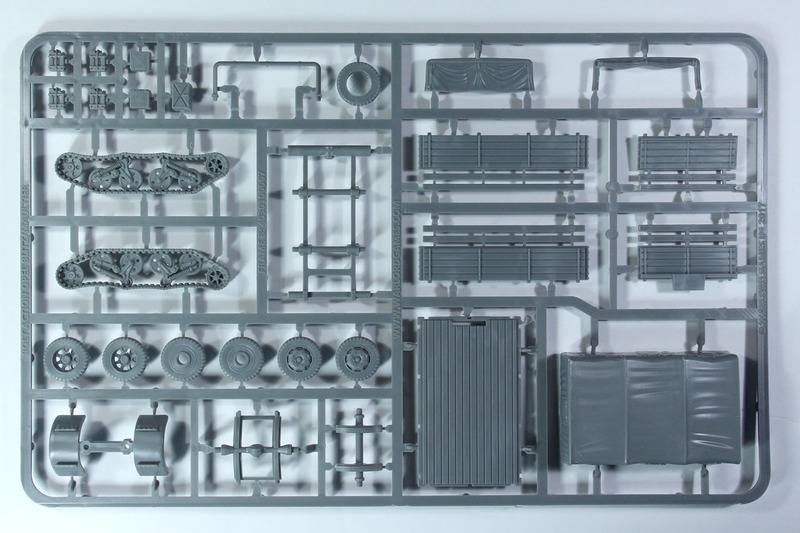 It is important to note, that this is a Warlord Games hard plastic kit, like the Marder III / Pz 38t, and not a cooperation with Italeri. 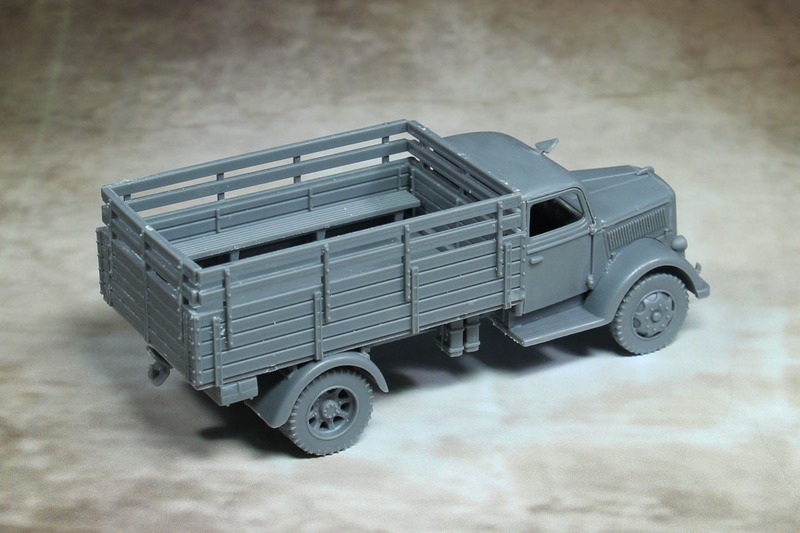 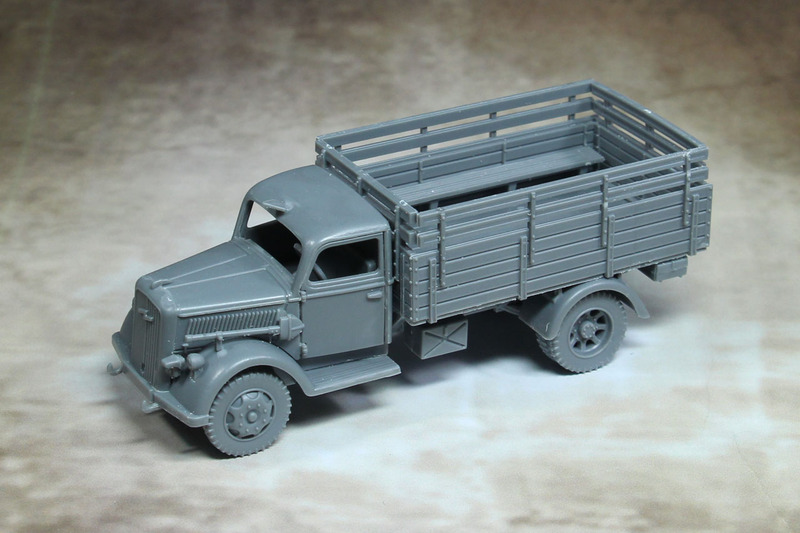 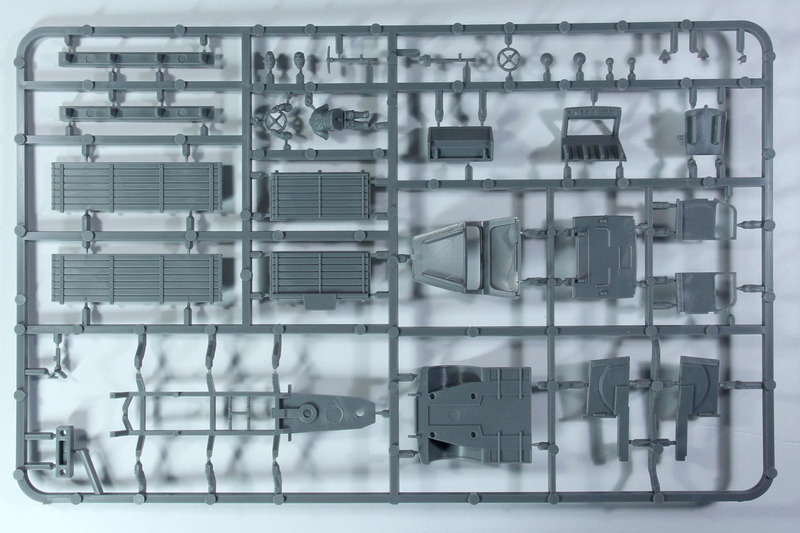 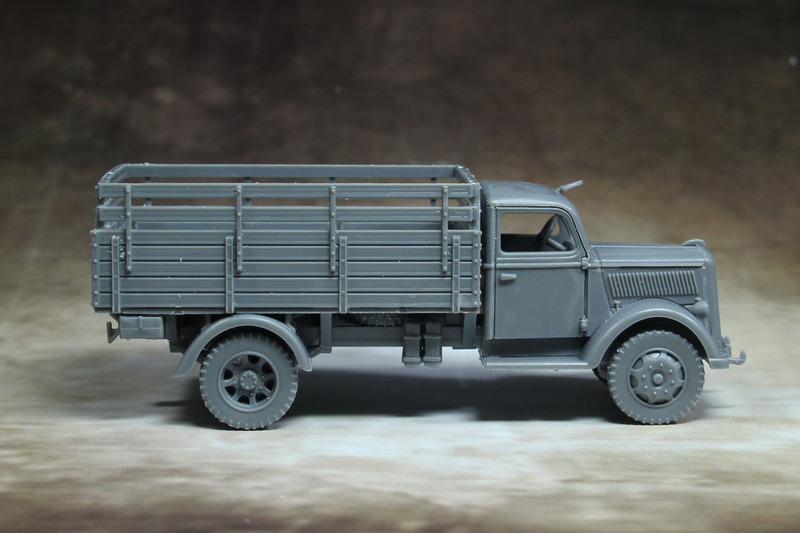 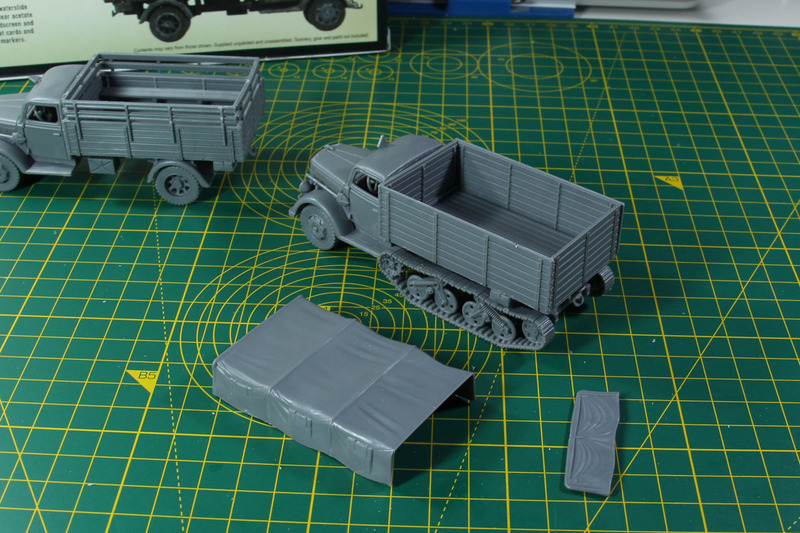 The sprues are kept in grey plastic and are two for the truck / half-track and an additional sprue for the passengers. 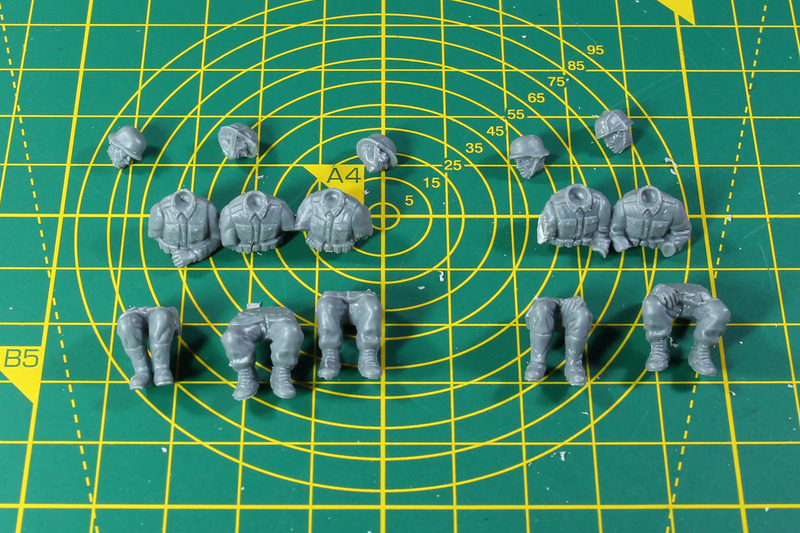 Casting is properly done and the sprues are pretty filled. 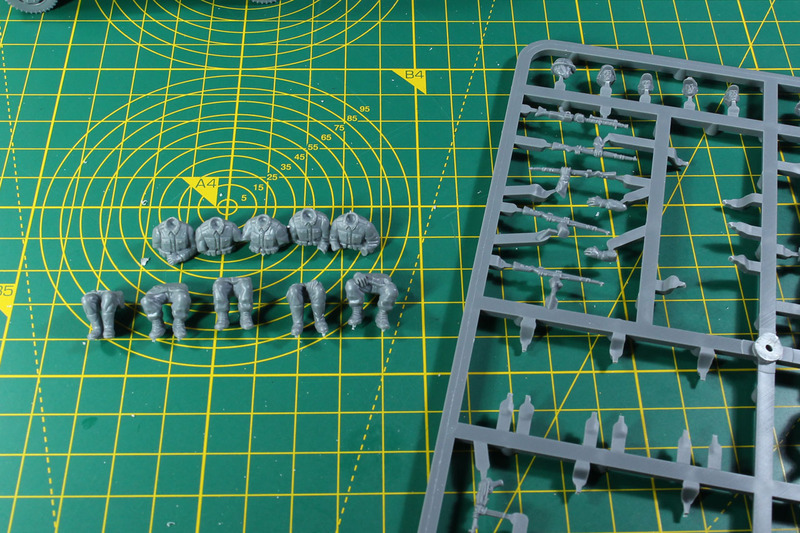 As you can see, these are regular sprues with the bevelled edge frame. 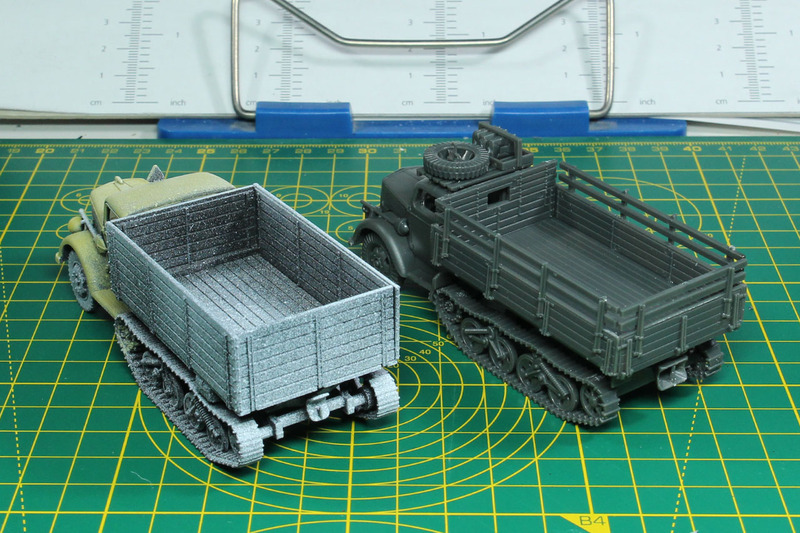 The sprues contain the different variants of the flat bed as well. 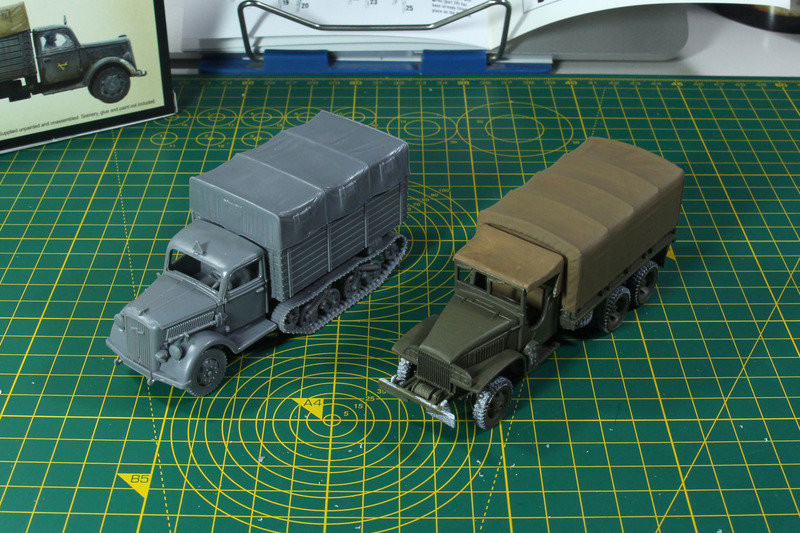 In this review, I'll build two kits simultaneously. 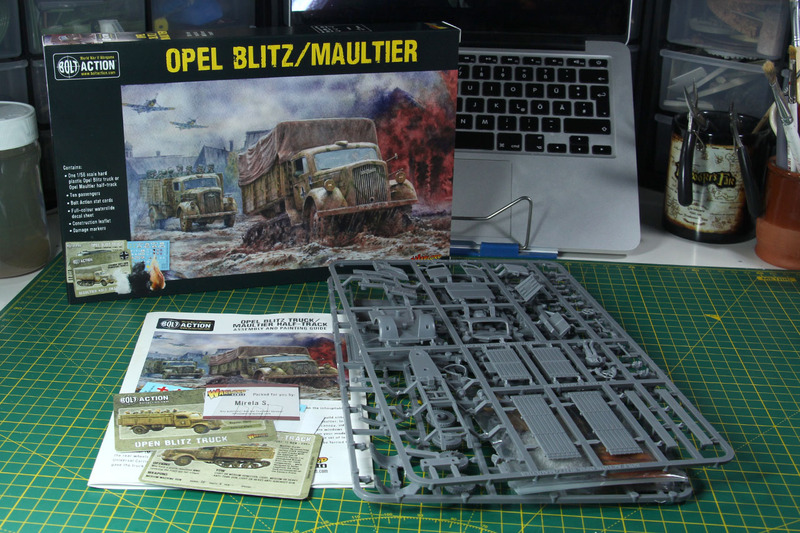 One as a Opel Blitz and one as a Opel Maultier. 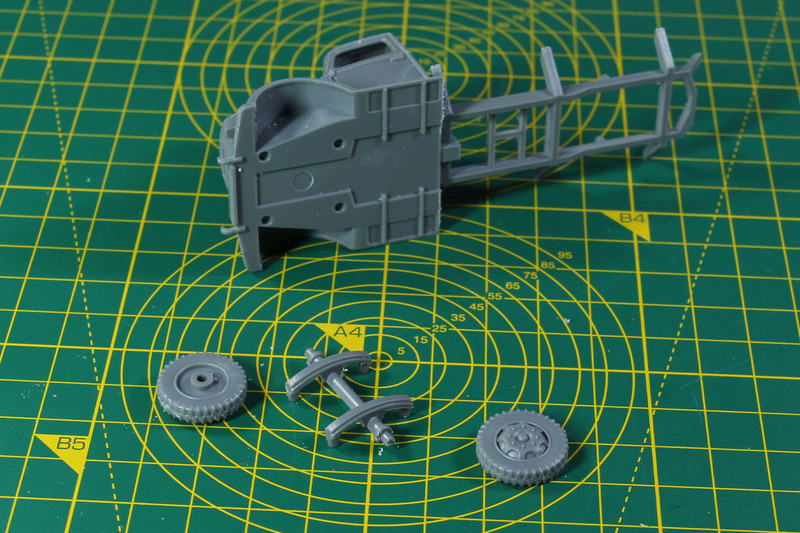 Building of both starts with the same parts, the frame of the chassis. 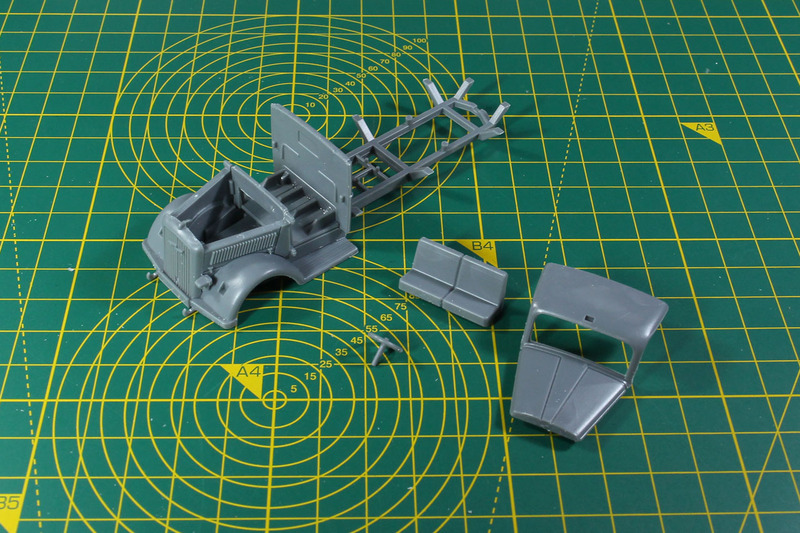 The drivers cabin is made from multiple pieces and depending on if you want to use a driver and / or wind shields, should not be entirely glued together. 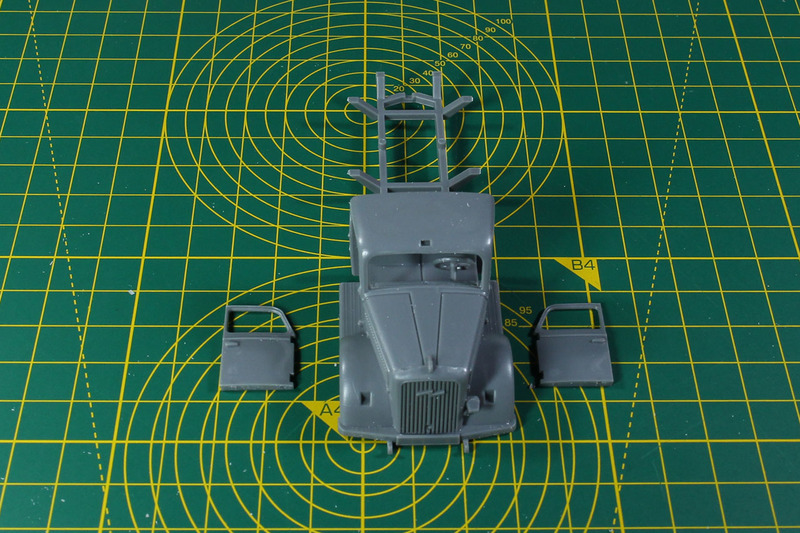 The driver is optional and comes with two different heads, one with a side cap and one with a field cap. 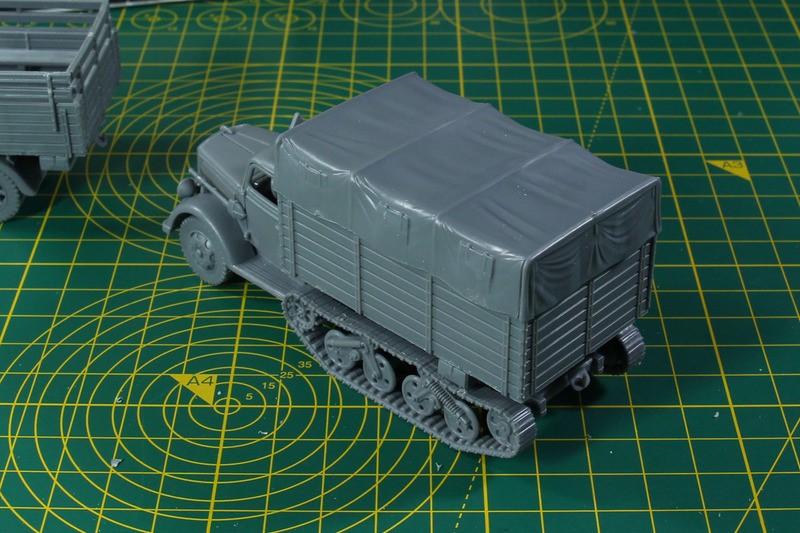 And it does not only cover the templates for the wind shields, but the matching transparent film. 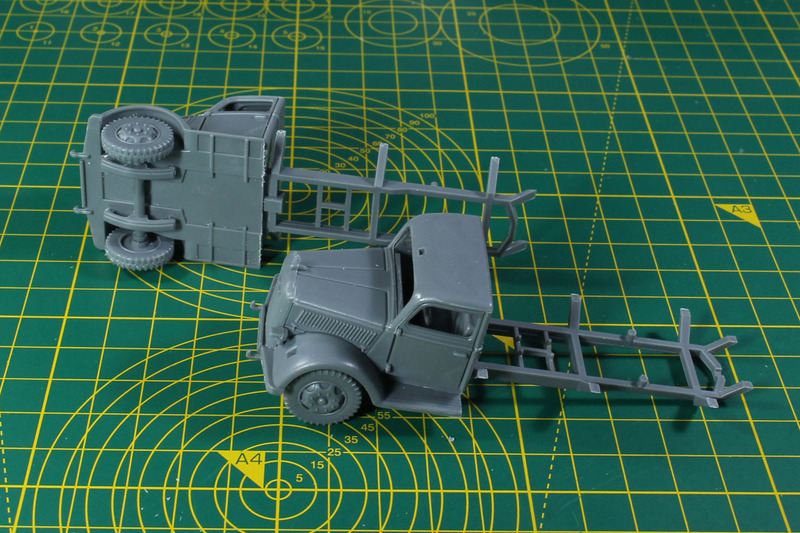 The leaf springs for the front axle are added to the carriage, along with the front wheels. 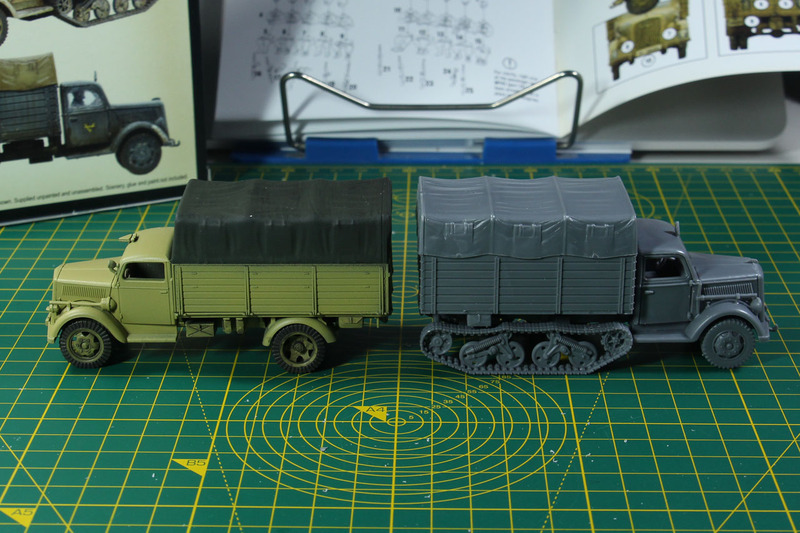 This is the same step for Blitz and Maultier, but in the next step the differentation begins. 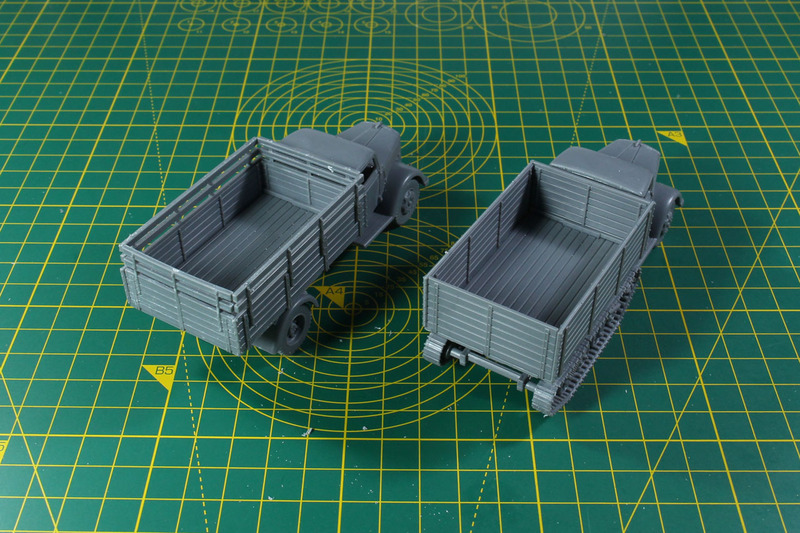 As you can see the leaf springs for the twin wheel axle and the frame for the tracks are added. 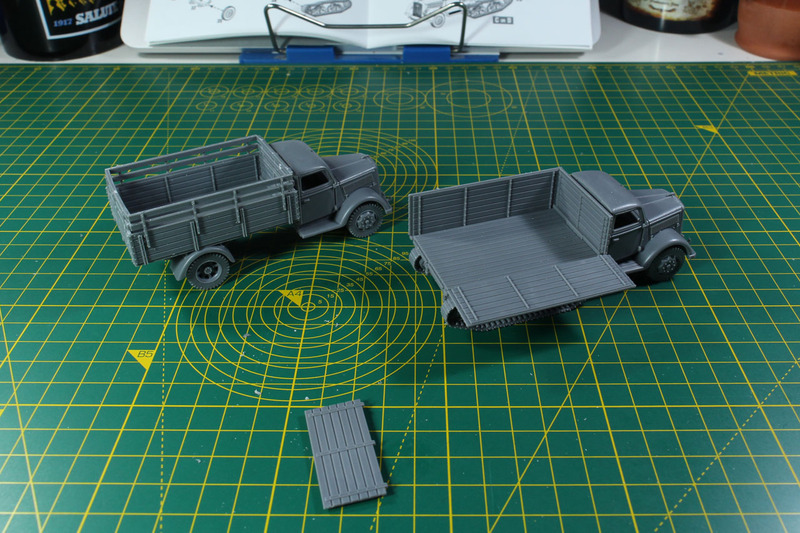 The flat bed has two different panel options, low ones with extenders and high panels. 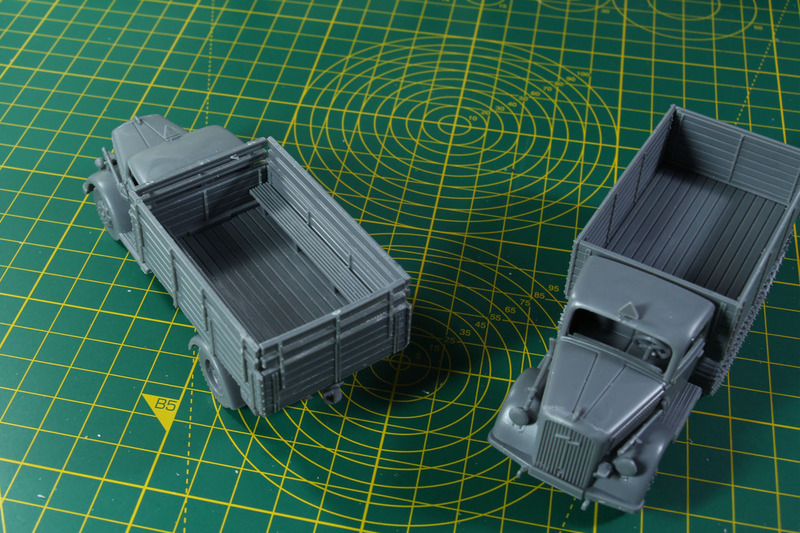 If you want to add the canopy, you need to choose the high panels. 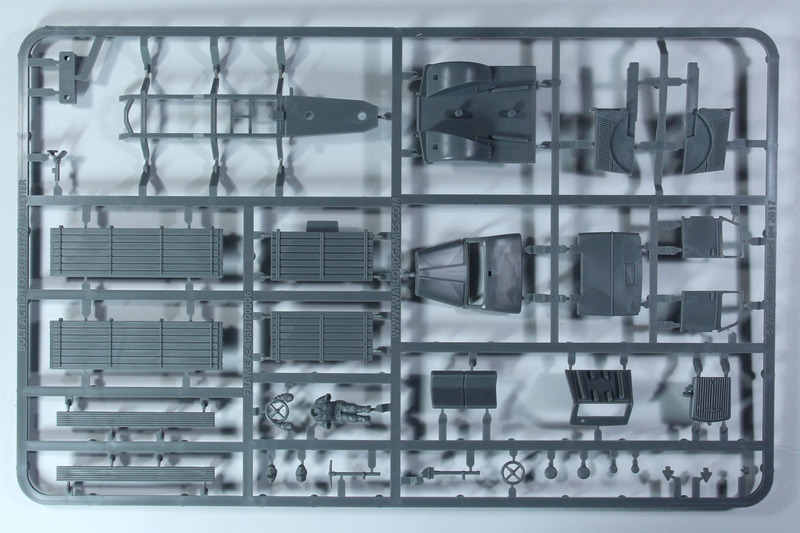 You could vary the position of the panels, for example to have it folded for (un)loading of troops or supplies, or to have the space to mount a 2cm Flak. 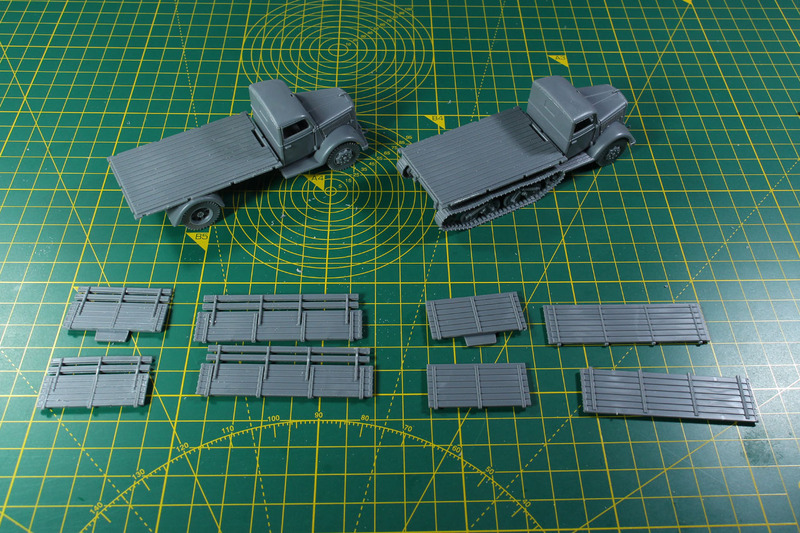 Independend of which panels you choose, in the next step the boxes and cans are added to the underside of the flat bed. 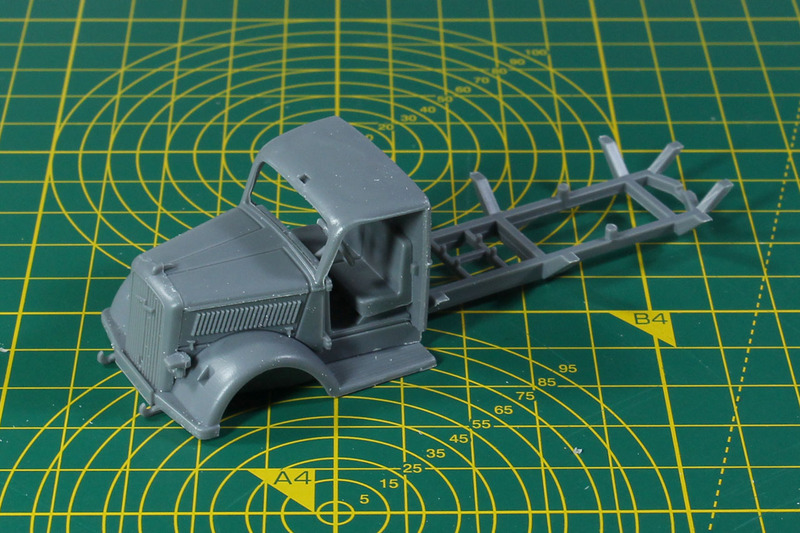 In the last step before the passengers, the details like the tools and benches are added. 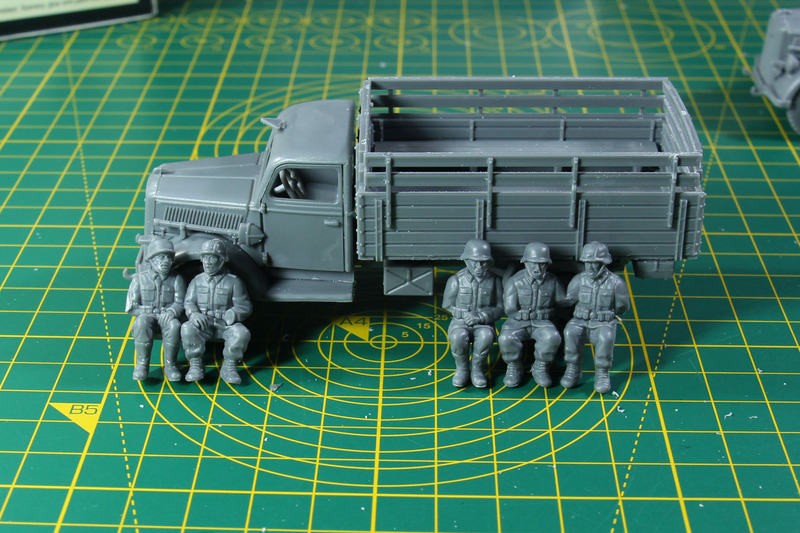 The benches are optional, but recommended if you want to add the passengers. 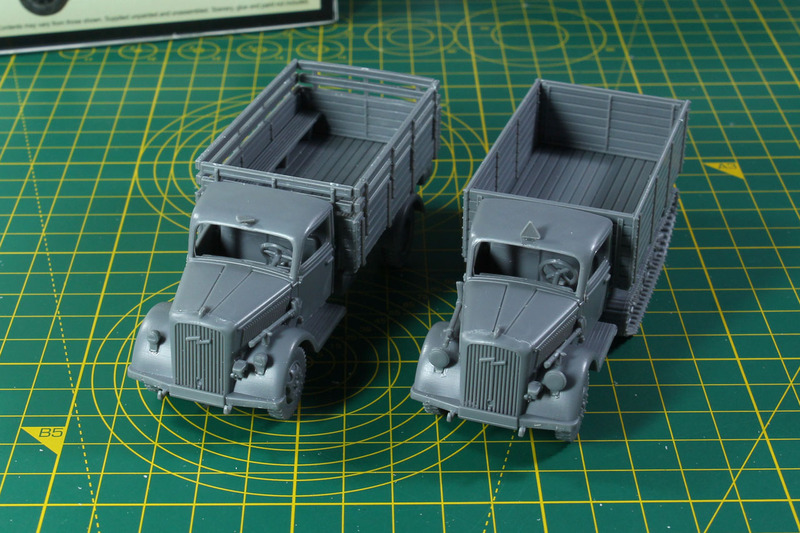 You can add the folded canopy to the front of the frame if you want to (only on the high side panels). 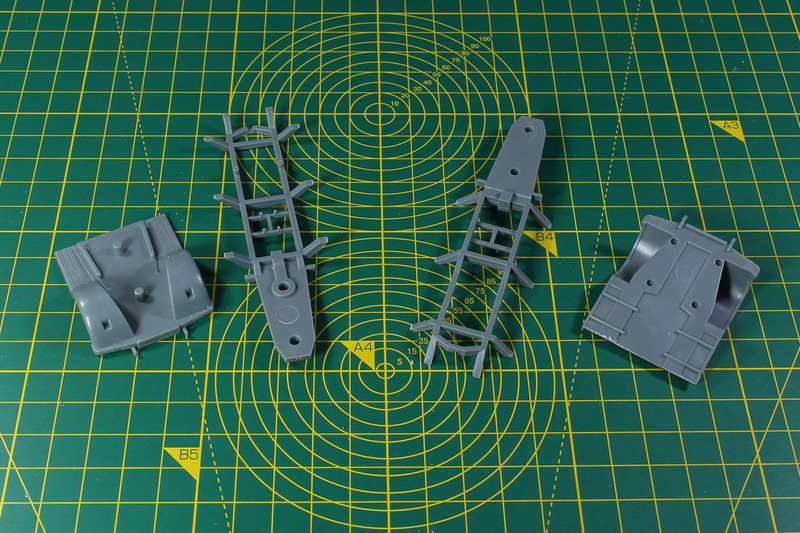 Otherwise you have the option for the closed canopy, with the further variant of the open or closed back part. 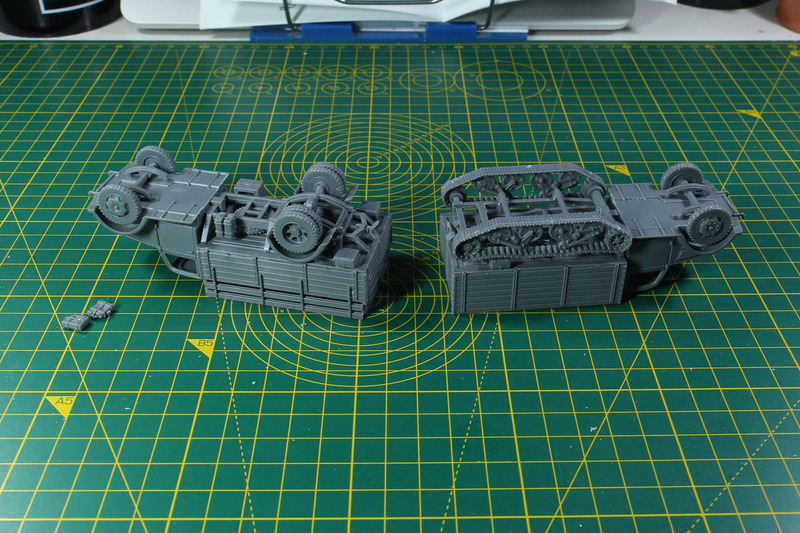 As for the passengers, these are set up to be build in two strips of five, but you can easily cut them apart and spread them out a bit. 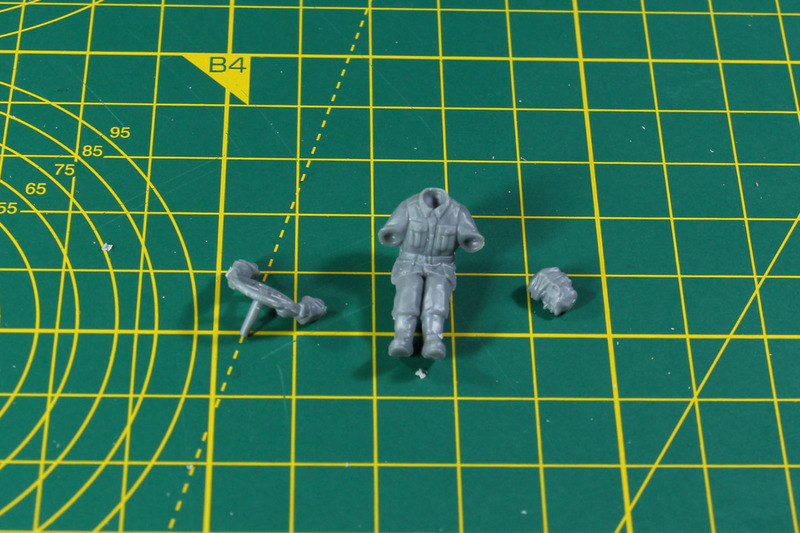 They come with individual heads and arms, and different weaponry. 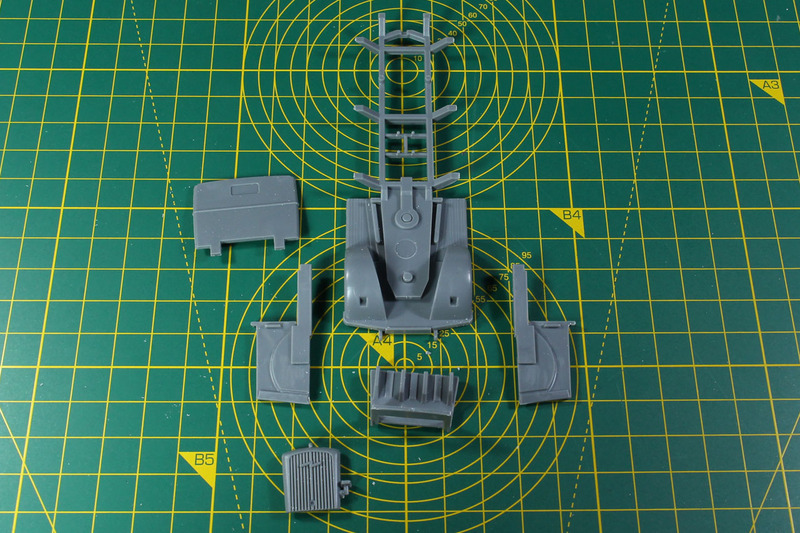 It is recommended that the legs and arms are added as in the instructions, the heads and further equipment can be mixed to your liking. 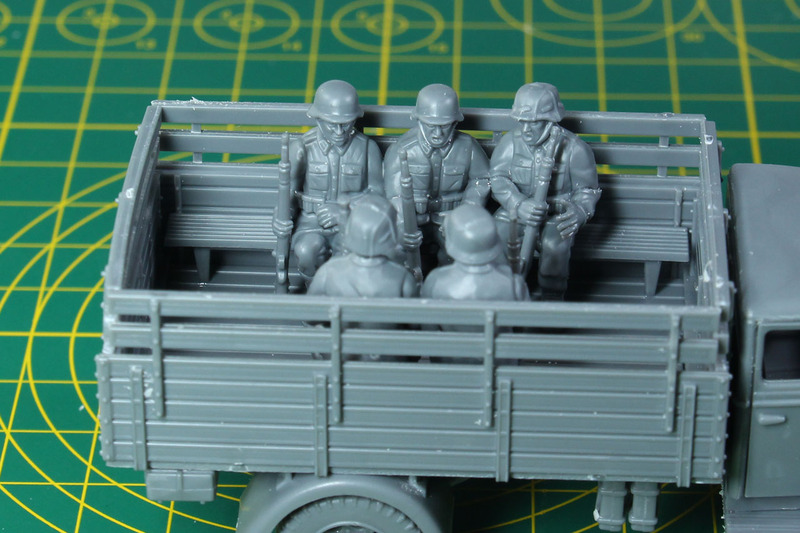 The troops on the benches could be converted further with bits from the German kits. 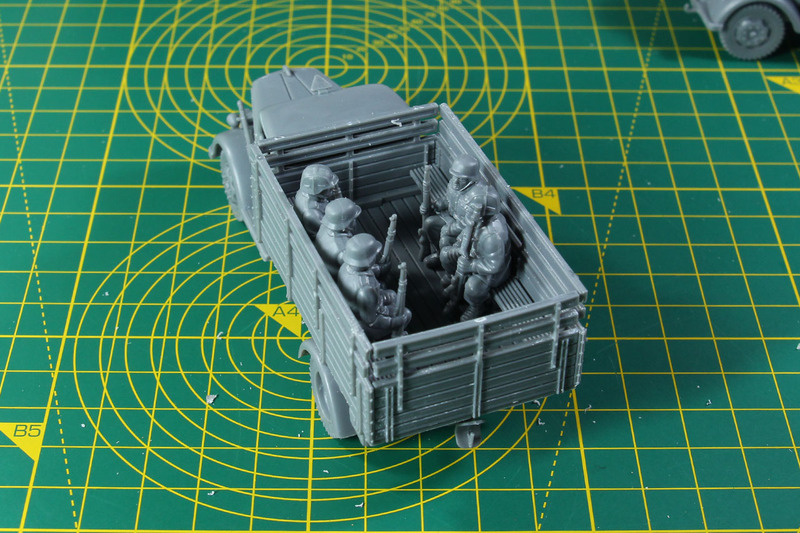 I have seen a soldier playing the accordion or waving around bottles of beer (using the molotov cocktail from the russian sprue) in some conversions. 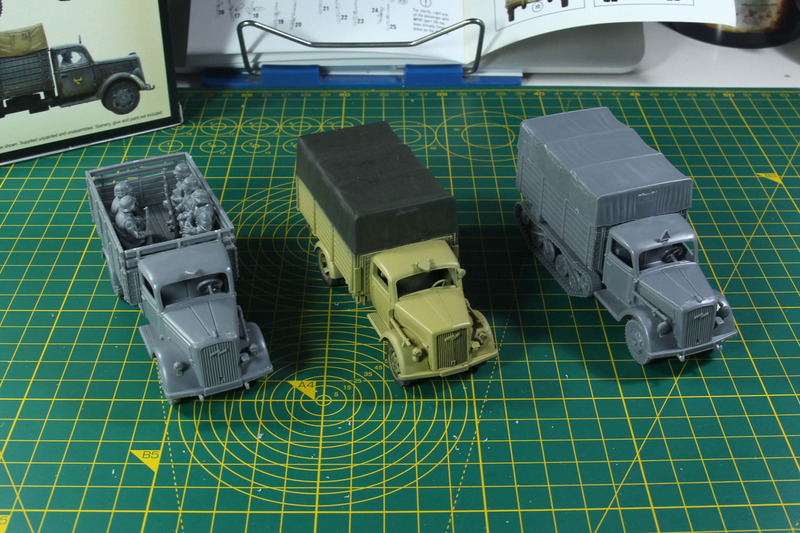 As for comparison, the Opel Blitz and Maultier by Warlord with to a Rubicon Blitz in the middle. 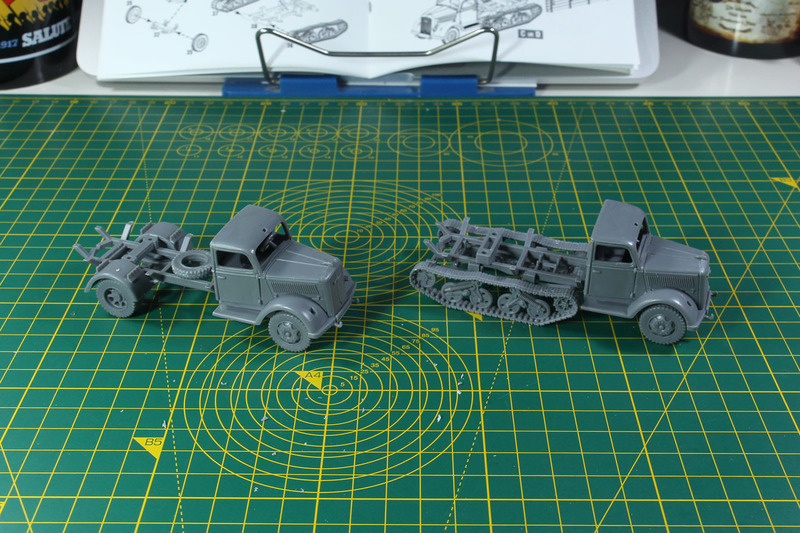 Here the side by side comparison of the Maultier next to the Rubicon Maultier. 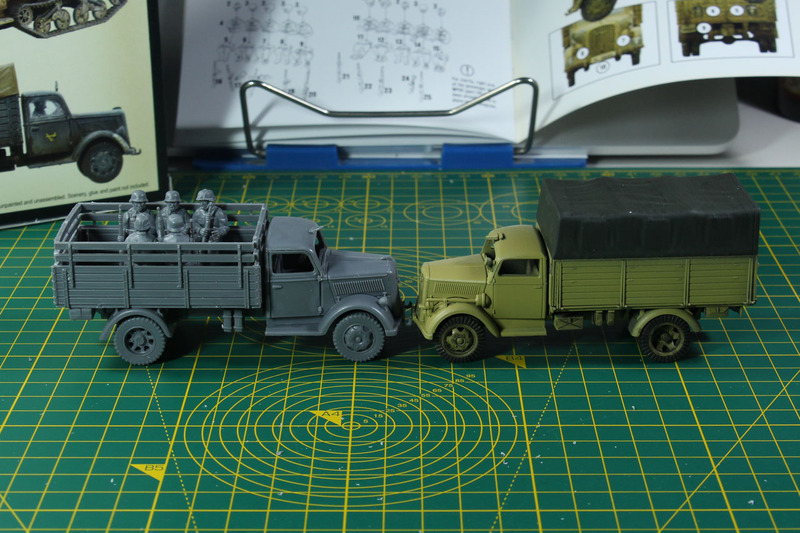 And next to the GMC CCKW by Rubicon. 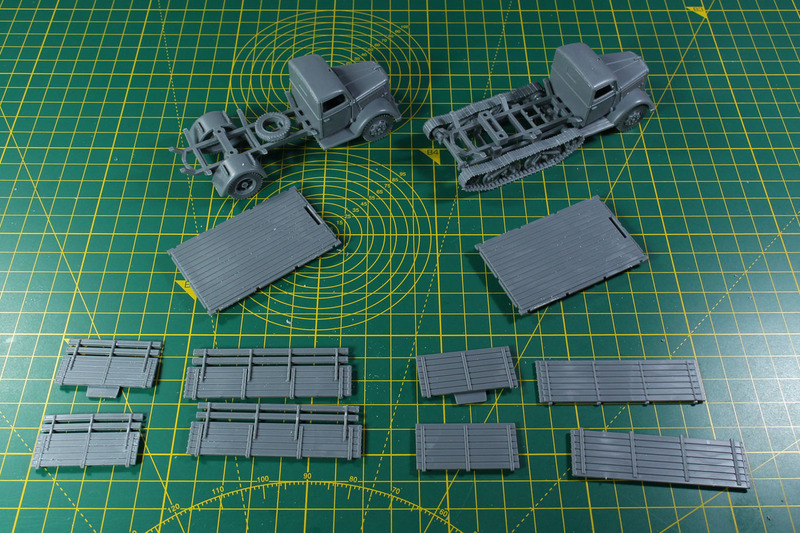 Of course, no review with the concluding set of pictures of the assembled vehicle. 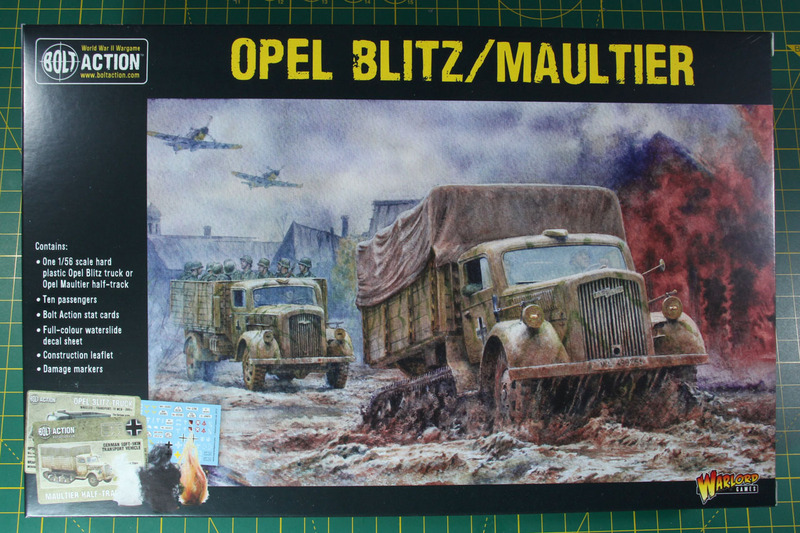 The Opel Maultier with the closed canopy, and the Opel Blitz with benches. 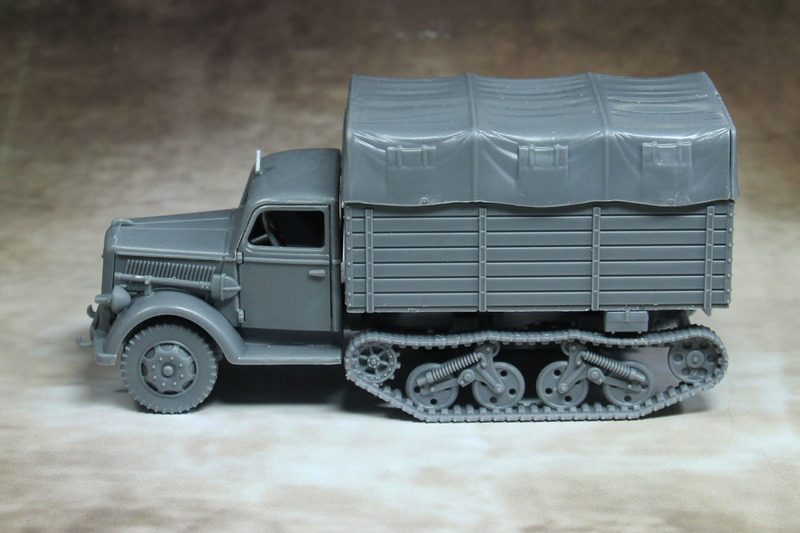 This is one of the Warlord Games' own hard plastic kits, and they have a certain simplicity to them - but in a good way. 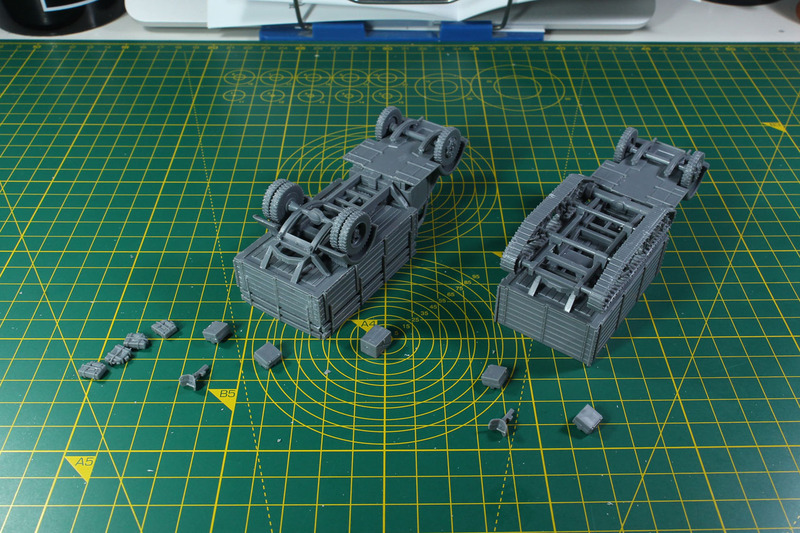 They are rapidly build and sturdy enough for gaming. 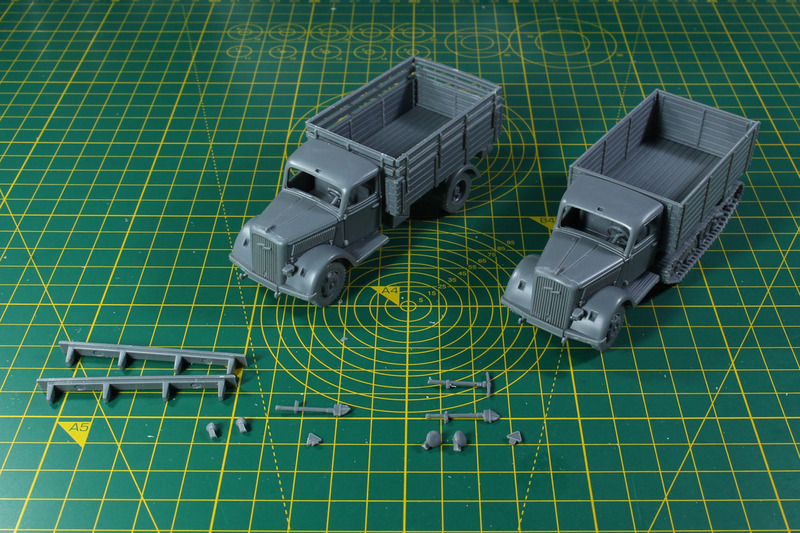 I like the aspect, that this kit is a combo kit, that gives you the option to build either the Maultier or the Blitz, and the three different cargo options are a great addition as well. 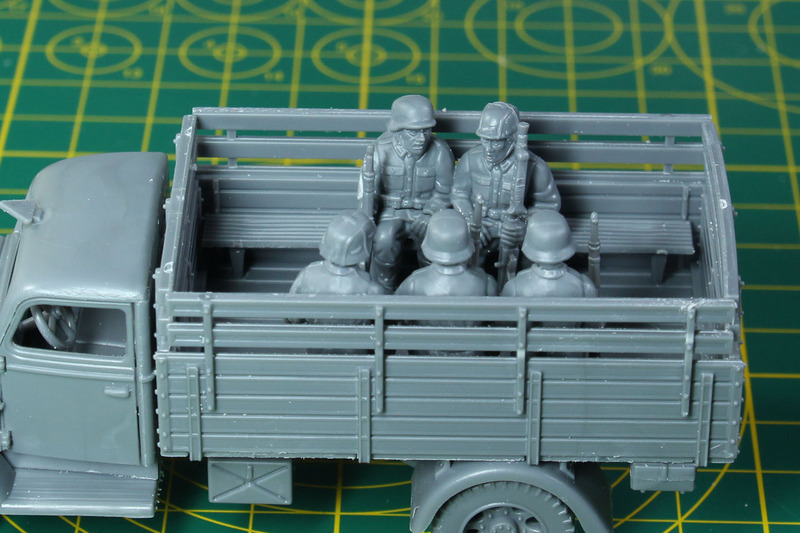 And on top you get a sprue with passengers. 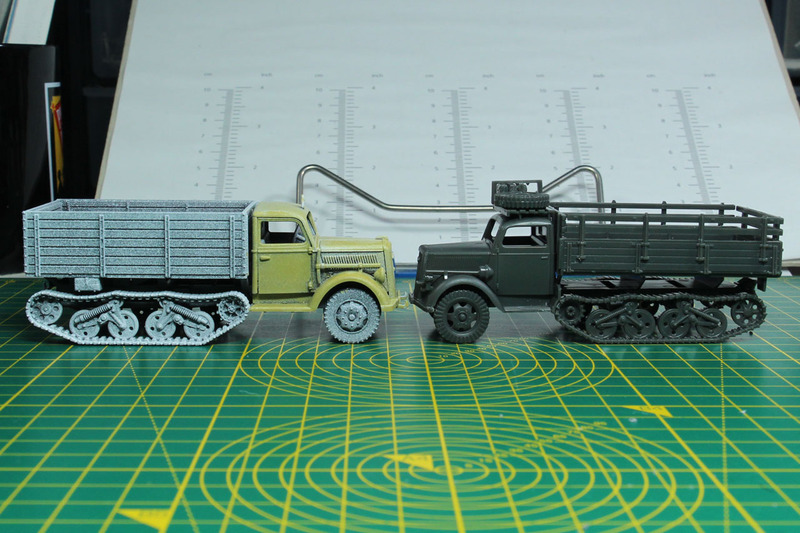 What not to like? 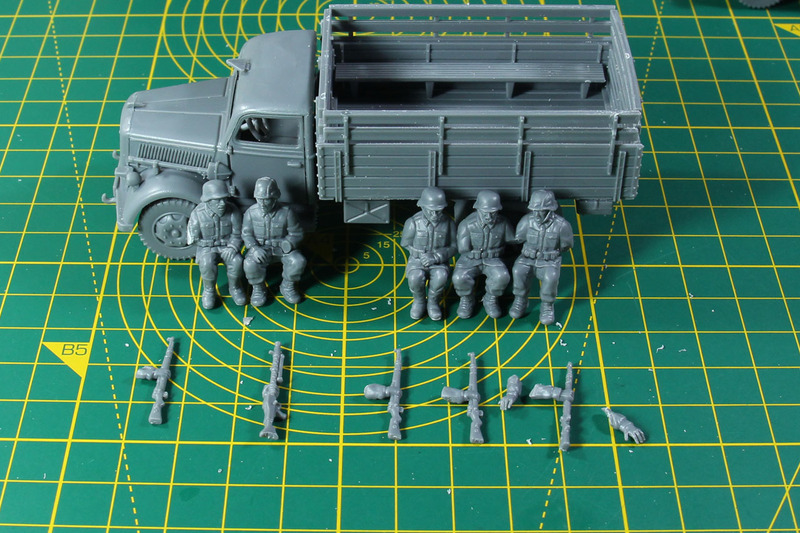 It costs the same as the Rubicon Maultier or Blitz kit, but covers the stat cards, damage tokens and passengers on top. 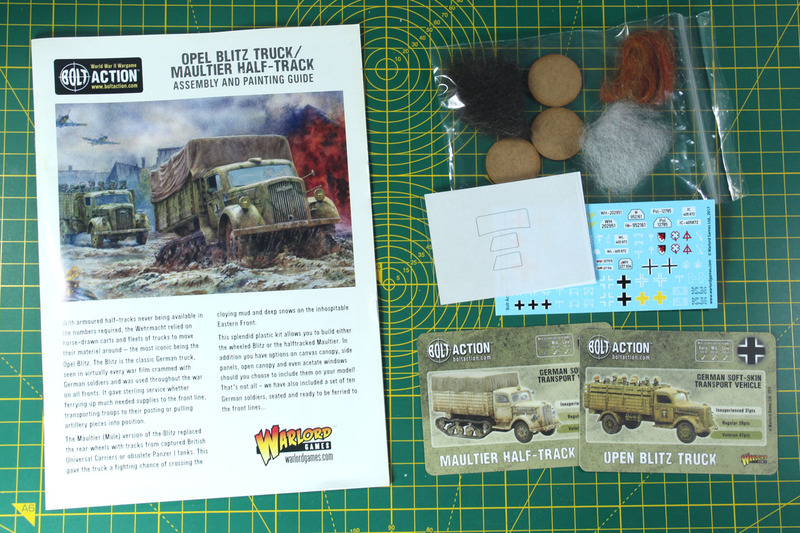 And in the current situation the Warlord Games kit is much easier to come by, as the distribution network is much stronger compared to Rubicon. 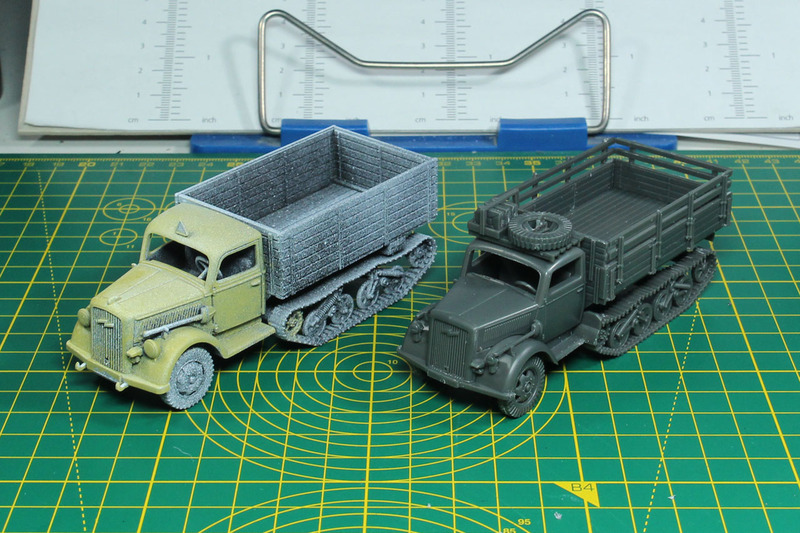 If you are more into the model kit building aspect and value the detail above all other things, the Rubicon kit may be your favorite, but other than that this is proper competition. 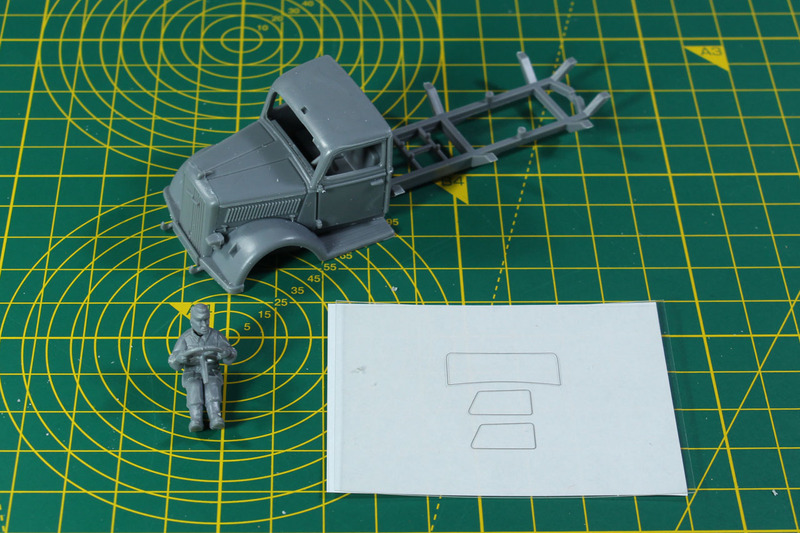 I didn't try it out myself, but I assume that you could add the box body from the Rubicon conversion kit to this kit with a bit of cutting / glue. 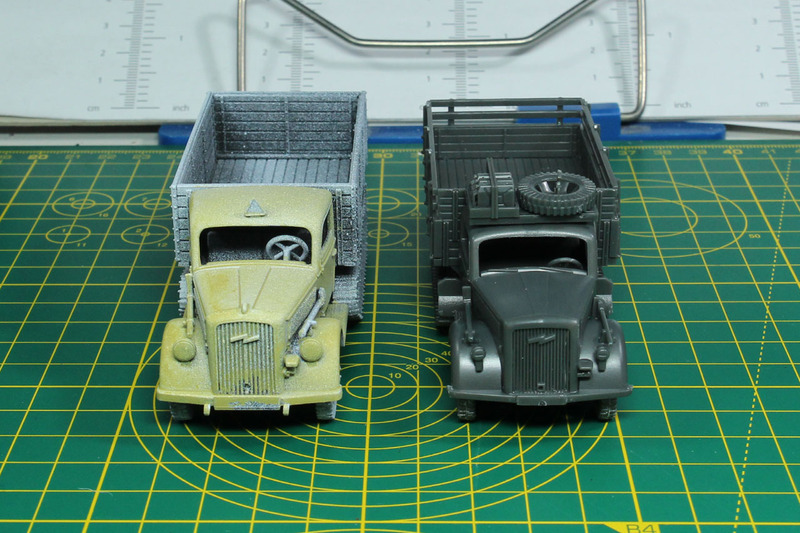 I built the old resin Opel Blitz and this plastic kit is such a huge improvement compared to the old kit. 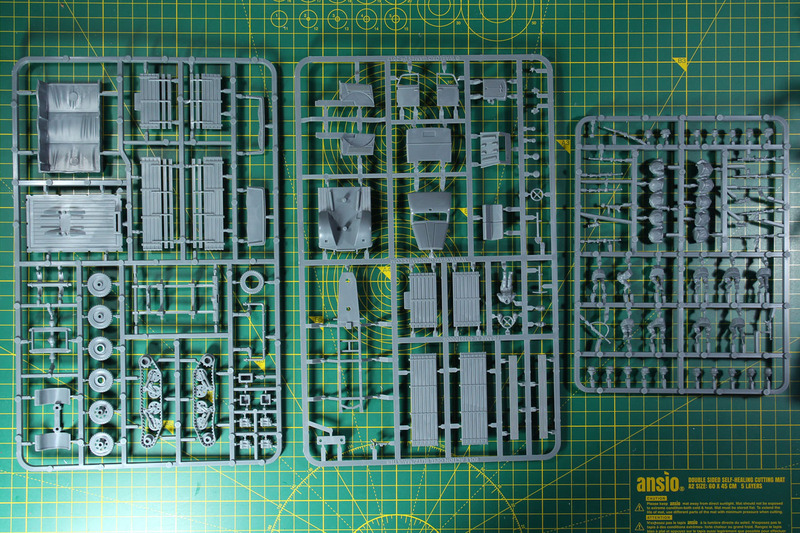 It is so hassle free to build and such a great fit. 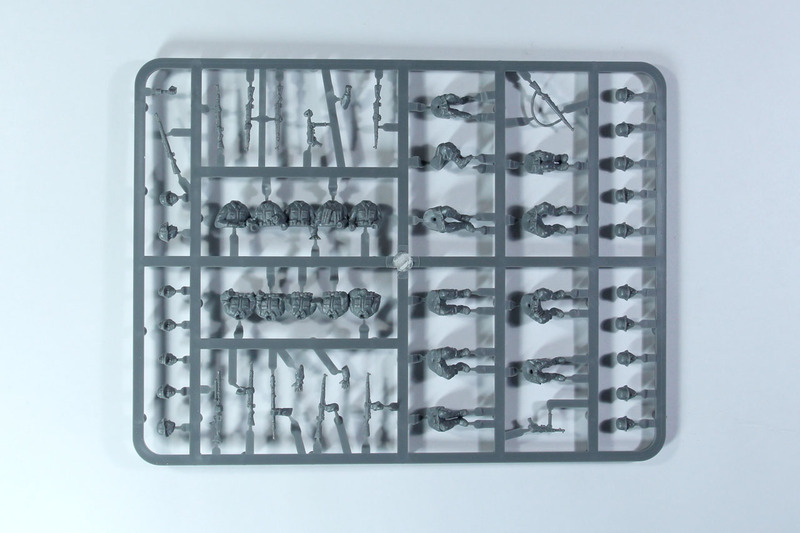 I am more than satisfied with this and would hope, that the production schedule of Warlord Games has more slots for kits like these. 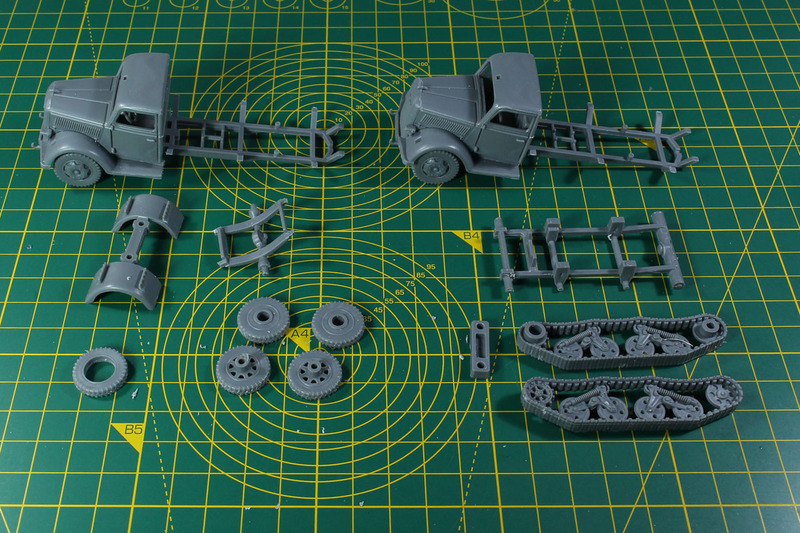 To be honest, I am a bit surprised that they didn't offer this kit as a zug / platoon with 3 kits for 50 GBP, as they did with some of the tanks or that there isn't a mobilised infantry pack where you would get two of the Grenadier sprues and one of these. 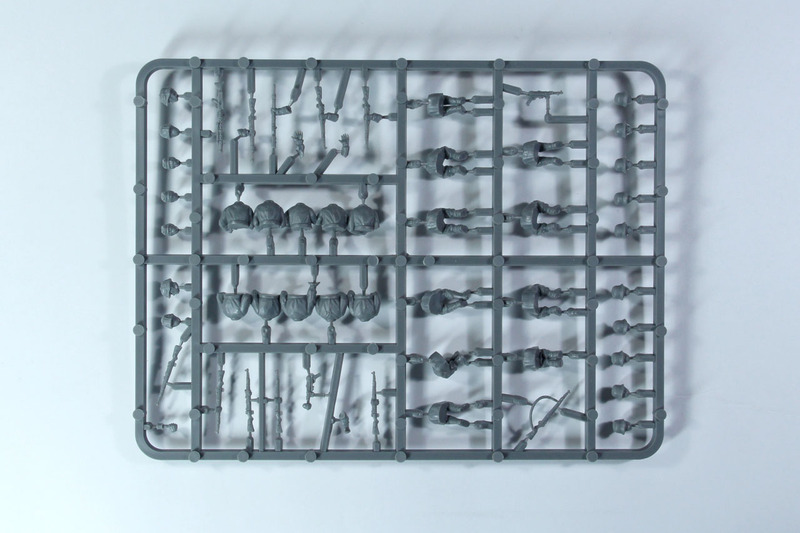 The "only" deal that comes close it the motorised column deal.